Abstract: Objective To evaluate the biological behavior of osteoblasts on porous titanium alloy scaffold materials by using different ultrasound intensities, screening out the optimum intensity. 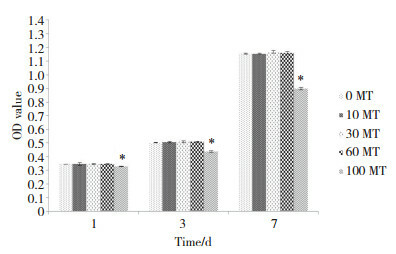 Methods According to different ultrasound intensities (0, 10, 30, and 100 mW/cm2), the materials were randomly divided into 5 groups (0, 10, 30, 60, and 100 MT). The MC3T3-E1 pre-osteoblasts were seeded onto the materials in each group. 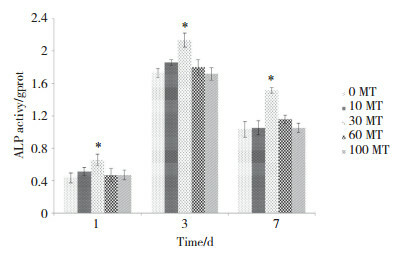 The adhesion, proliferation, and differentiation rates of the osteoblasts were evaluated using scanning electron microscopy (SEM), and methyl thiazolyldiphenyl tetrazolium bromide (MTT) assay, proliferation index (PI), and alkaline phosphatase(ALP) assay. Results SEM imaging revealed that the cells on each group spread well and grew into the material inside the aperture. The MTT values at 1, 3, and 7 d in the 100 MT group were lower than those in the other groups, with a statistically significant difference(P < 0.05). However, no statistically significant difference was found between the other four groups. The PI value in the 100 MT group at 5 d was lower than that in the other groups(P < 0.05), with a statistically significant difference. The ALP values at 1, 3, and 7 d in the 30 MT group were significantly higher than those in the other groups, with statistically significant differences(P < 0.05). 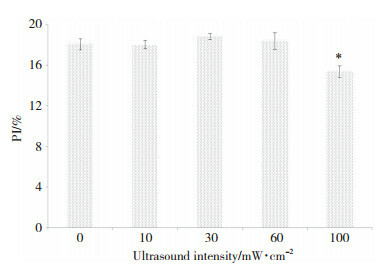 Conclusion The optimum ultrasound intensity was 30 mW/cm2 under this experimental condition. 王丹宁, 赵宝红. 钛种植体表面微弧氧化技术研究进展[J]. 中国实用口腔科杂志, 2010, 3(9): 570-573. 祖海越, 易雪婷. 不同辐照时间低强度脉冲超声促进人成骨细胞的生物学效应的研究[J]. 生物医学工程与临床, 2017, 21(4): 356-362. 安恒远, 李雪, 王大新, 等. 低强度脉冲超声波对软骨细胞中金属蛋白酶-13与Ⅱ型胶原的影响[J]. 中国康复医学杂志, 2011, 26(3): 226-231.